This Series of thirteen (13) images has been developed for a fellow co-laborer we’ve known as a family for many years now, for which up to this point she has NO clue it is done. Her words shared via a Social site were very touching, for which all that know her know, they are serious. Was immediately impressed upon by the Holy Spirit to finish up the Series that was being finalized and put on hold the next Series under development, so this one would be my available attention. God the Father knew I’d need the coaxing to do so. Therefore take no thought, saying, What shall we eat? or, What shall we drink? or, Wherewithal shall we be clothed? (For after all these things do the Gentiles seek:) for your heavenly Father knoweth that ye have need of all these things. The statements, taken in order, make up the statements made in that same order. It appeared that the order was purposeful, so that trail was followed, making application of Bible verses as the study yielded them. Sometimes we can place ourselves in places where we are expected as Christians to stand up, then seek God’s Face in His Throne Room. Even then, we need that Encouragement from His Word and how it permeates our lives so others can clearly see Who has possession of us clearly. 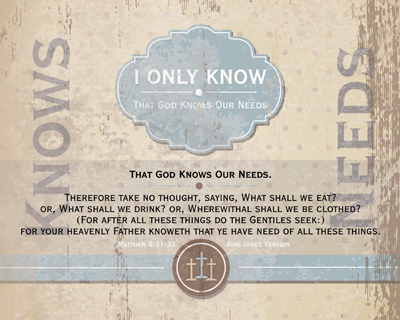 Indeed, our Heavenly Father knows our every need, with which in His timing and our obedience, those needs will be supplied. 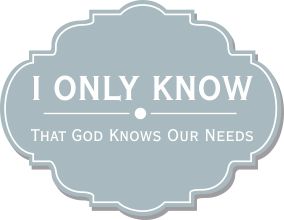 The listing of words that follow were taken from the sentences of “I only know…” which became the searching focus to locate passages of Scripture, making this Series one that will touch all of our lives. The listing of sentences can be found on top the Series page, in the same order as they are presented here. What an incredible and overwhelmingly Encouraging this Series has become… The Word of God will do just that, that is if we as Christians will allow it to be. Indeed, we can easily see that our every need will be supplied and our lives will be satisfied by the One who has the (A)bility, (A)uthority and (A)bleness to do so. The Bible is better than any triple letter help group and gives us a triple-A program (AAA) that we can lean upon which changes the very being, not just a habit. Here’s to you my Dear Friend, may the impasse you are experiencing be illuminated by God’s Word, as we are Encouraged by His Handiwork in our own lives!